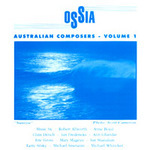 OSSIA : Australian composers, Volume 1. Contemporary Australian violin : thirteen compositions for solo violin and violin and piano / edited by Lawrence Whiffin. Bundoora, Vic. : La Trobe University Press, c1991. Commission note: Commissioned by Natalia Cohen. 6 Apr 2009: at Czech Mates (Music Workshop, Sydney Conservatorium of Music). Featuring Ole Böhn, Daniel Herscovitch. 22 Mar 84: Banff School of Fine Arts, Canada. Featuring Natalia Cohen, Helge Netland.